Your users need to be trained and remain on their toes with security top of mind. Phish Your Users: Fully automated simulated phishing attacks, hundreds of templates with unlimited usage, and community phishing templates. See the Results: Enterprise-strength reporting, showing stats and graphs for both training and phishing, ready for management. Show the great ROI! On-demand, interactive, engaging, auto-enroll training modules covering all important topics. Automated training campaigns with scheduled reminder emails. Fully automated simulated phishing, vishing and smishing attacks, hundreds of templates with unlimited usage, and community phishing templates. USB attacks coming soon. Need to meet the FFIEC internet banking guidance? 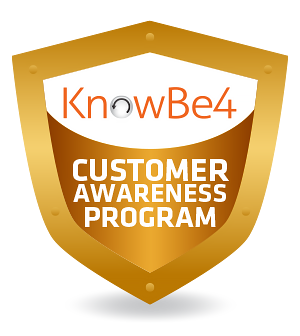 KnowBe4’s innovative and user-friendly Customer Awareness Program (CAP) educates your customers specifically about safe online banking, but also about passwords, giving out personal information, protecting children online, protecting your identity, securing your computer and home network, spam viruses and more, opening up email and attachments. Specifically, we train people to spot social engineering red flags in email. The KnowBe4 CAP is a great fit for retail consumers at the house, but also for employees in accounting and your commercial customers. It can provide you with ways to assess your awareness program’s effectiveness in accordance with federal mandates, and we can help you with the documentation of your organization’s compliance efforts. The biggest benefit you will see is increased customer loyalty, and will find significantly less actual fraud attempts and losses relating to ID theft. This program pays for itself in more than one way. Prompted by the Federal Financial Institutions Examination Council’s (FFIEC), banks and credit unions are more and more educating their customers on cyber-risks. The weak link in IT security is the end-user and individual security awareness training is a key defense against fraud and identity theft. Providing education for customers on threats like phishing, social engineering and general information security practices is among the top agenda items for financial institutions. You need an innovative partner to help you create, deploy and manage your Customer Awareness Program. 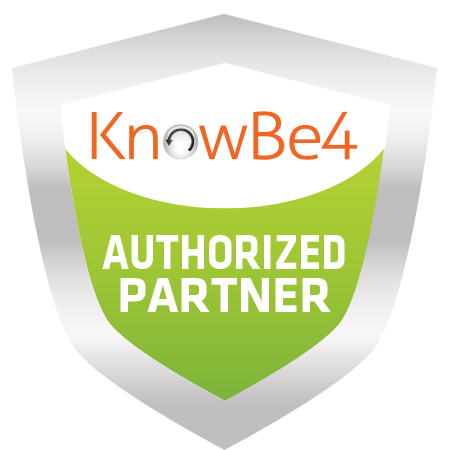 Contact us today to learn how KnowBe4 can help educate your commercial customers’ employees and/or retail clients how to stay safe online, and at the same time fulfill your compliance requirements. The KnowBe4 Compliance Manager (KCM) simplifies the complexity of getting compliant and eases your burden of staying compliant year round. Pre-built requirements templates for the most widely used regulations. Quickly see what tasks have been completed, not met, and past due. With automated email reminders, your users can stay ahead of any gaps in compliance. See how you can minimize the busy work associated with audits and compliance. On-demand, browser-based training by "The World’s Most Famous Hacker"
15-minute version translated in 26 languages - cick to see the list. Allows you to create a "Human Firewall"
After a year of helping their customers train their employees to better manage the urgent IT security problems of social engineering, spear-phishing and ransomware attacks, KnowBe4 decided to go back, and look at the actual numbers of 300,000 users over those 12 months. We aggregated the numbers and the overall Phish-prone™ percentage drops from an average of 15.9% to an amazing 1.2% in just 12 months. The combination of web-based training and frequent simulated phishing attacks really works. GEO-location - See where your simulated phishing attack failures are on a map, with drilldown capability and CSV-export options. EZXploit™ is a patent-pending functionality that allows an internal, fully automated "human pentest"
Customizable "hover-links" when a user "mouse-overs"
KnowBe4 is in the business of training employees to make smarter security decisions. Whether you have 50 or 50,000 employees you have the best security software your budget allows. But still your network is being compromised. All it takes is one or two clicks by an employee to infect a workstation and allow hackers in! 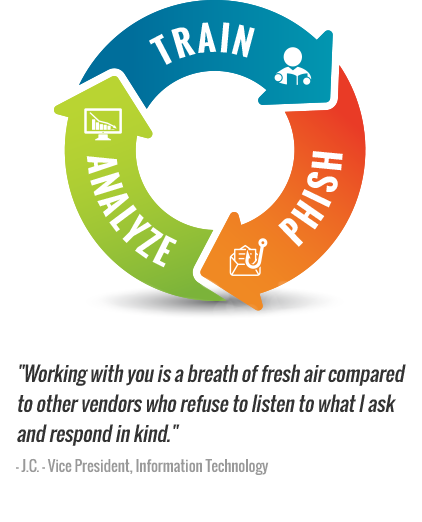 Cybercriminals know how to phish your employees. This is a simulation of what can actually happen if an employee clicks on an infected email. It just takes one click and your entire network could be held hostage by ransomware, most of the time payable only by bitcoin. 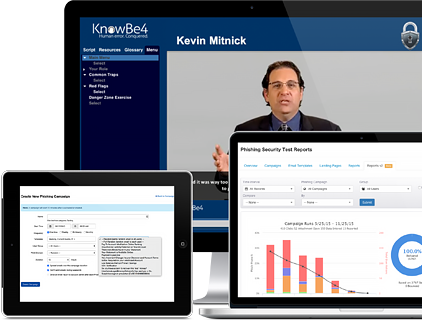 Our specialists are expert in designing KnowBe4 security awareness training solutions and can help you create a plan for implementing a new level of awareness. Optrics offers customized quotes on KnowBe4 security awareness training solutions that will help traing your staff to become a "human firewall".